Pedestal sinks are becoming increasingly popular these days, as people give more value on space and simplicity. Even though pedestal sinks do not offer lots of storage space, they are still pretty hot in the marketplace for their high style and good looks. 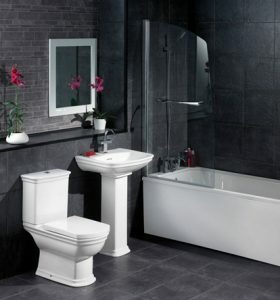 Pedestal sinks are also perfect for smaller bathrooms because they don’t take up a lot of precious floor space. For powder rooms, pedestal sinks work best because they allow a smoother traffic within the limited space. Wider console style pedestal sinks with a basin ledge are also a great addition to the bathroom for ore functionality. Furthermore, installing a pedestal sink is an easy job if you decided to replace your wall-mounted sink with it. However, if you are replacing a vanity set with a pedestal sink, old pipes could be exposed. And if they’re rusty and ugly, it could cause some remodeling challenge. One great way to address the problem is to replace short sections with shiny chrome pipes and a new trap assembly. Another great and cheaper way to fix it is by painting those old, rusty pipes. Because a pedestal sink takes up little space, both on the floor and the wall, installing it would also mean exposing more floor and wall spaces, which might have different colors from the rest of the bathroom floor and wall. Here are some professional reminders for you. The distance between your water supply pipe and the drain. Make sure you measure for both left and right pipes. Next, you will need to know the dimension of the new pedestal sink which your available area allows. You can base this from the space left behind by the sink you are replacing. Different types and styles of pedestal sinks require different ways of installation. Some manufacturers use a wall bracket while others use lag screws or toggle bolts through the holes in the back of the bowl to secure the sink directly into the wall. A lot of sinks rest directly on the pedestal while getting major support from the wall mounting brackets. For these types of pedestal sinks, installation usually requires completing several tasks and then assembling everything together. You will most probably need to purchase the drain, faucet and pop-up assembly separately. Before installing the sink, make sure you turn off the water to the bathroom or the entire house. Then you can preinstall the drain, the pop-up assembly and, finally, the faucet.